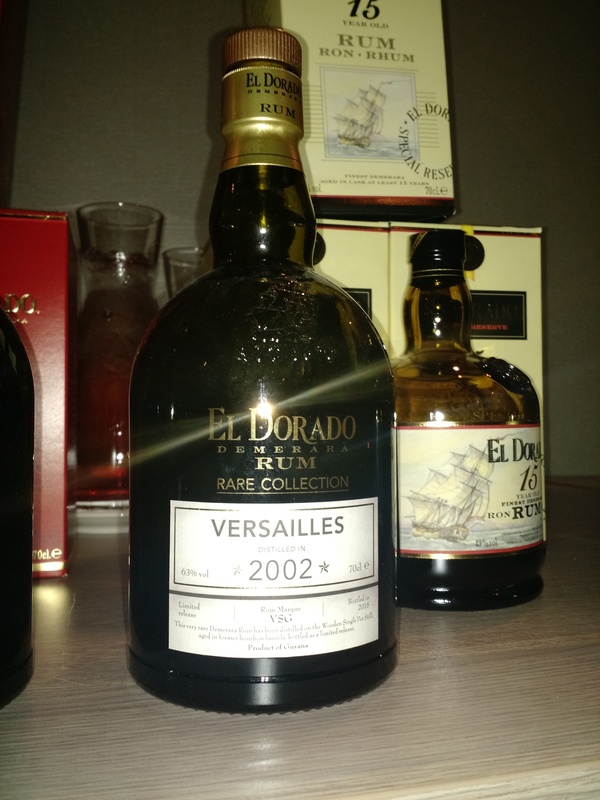 Have you found an online vendor selling El Dorado Versailles 2002? A very nice nose that needs to breathe a bit (63% vol). I pick up tobacco, homemade caramel, leather, vanilla and wooden planks with sap-like overtones. There’s no denying the pot still character. In the mouth the rum hit’s me intensely with the same lovely notes found in the nose, but it also feels a little sharper than other cask strength rums in this category. The finish is fairly subtle given the initial flavour explosion, but lingers for a while with a little woody caramel. Very nice. The slight lack of refinement and high price, holds this otherwise wonderful bottle from achieving a 9 in my book. My only problem with this rum is that it's too sweet for me, I would give it a solid 8 but that sugar was too much. Nice vanilla and caramel taste, sweet in the ending. Zero burn, and with 63% looks suspicious (how much added sugar? Didn't found anything online). I had this rum as an old fashioned. The taste was really good and complex. Starting with a chocolate flavor in the first place I experienced a very intense note of coffee in the aftertaste. A delicious rum which is unfortunately not one of the most affordable ones. Strong, sugar-coated almond, coffee bean, damson, milk chocolate, black pepper and thick molasses. Aftertaste is to strong for me. At 63%, it's a touch sharp. Caramel on the nose, a hint of tobacco, the molasses is there too. I'm surprised at the sweetness, yet, it's plenty woody, with just a touch of sour fruit in the finish. La bouche est huileuse et la réglisse prend plus de place, apparaissent aussi le cuir, le tabac, le café et une petite amertume. La finale est longue et calquée sur les saveurs en bouche. On the nose, notes of nuts are released on the almond and walnut. It is nevertheless very fresh with perhaps a little orange aroma. In the mouth, alcohol is present but the sweet side makes for a good balance. Very complex with a super long finish. It is a beautiful rum but like his brother Enmore, it is just as expensive. Light, brown sugar, and slightly sour nose. Taste is heavy, strong brown sugar continues with a dark wood overtone. Slightly sour and moderately short finish. Overall an OK rum but may be over aged. I don't think I'd choose to drink this again, little too heavy and sour ending. Top rum van El Dorado. Met een abv van 63℅ zijn de smaken en aromas erg sterk. Caramel, tabak, tropisch fruit, kaneel.